Im up at 8.00am and Tam is already on the balcony. Its the last full day of our cruise and we mostly intend to be doing nothing again. Breakfast is in Blu where we are sat next to a couple of guys who we have seen around the ship several times during the cruise. When I ask if they are flying straight home from Singapore they say that they are flying on to Thailand for 10 nights, then back to Singapore to board the Solstice again for the return leg to Sydney. Now thats what you call a holiday. Today we are sailing through the South China Sea. All these places sound so exotic, we should be fighting off pirates or searching for the treasure of the Orient or something. Instead we lie in the Solarium as the skies are looking distinctly dodgy outside. You mark my words Jim lad, there be a storm a brewin. You can add meteorologist to my many skills as it soon starts to rain. I will admit this is more in the squall category then abandon ship, man the lifeboats, but its rain nonetheless. As we are in the Solarium we get a light lunch of grilled salmon from the Aquaspa Café before we go back to the stateroom. You can watch the previous Beyond The Podium presentations from the Solstice Theatre episodes on demand on TV, so we enjoy a talk from the pilot who got on in Brisbane and guided us safely up the inside passage of the Great Barrier Reef all the way to Darwin. Again, its very interesting and entertaining as he tells tales of various vessels hes been on  everything from 3 weeks on a luxurious yacht to 10 hours on a clunky old freighter. Hes 70 years old, although he doesnt look it, and still has to clamber up 9 metre rope ladders on the side of oil tankers in rough seas. 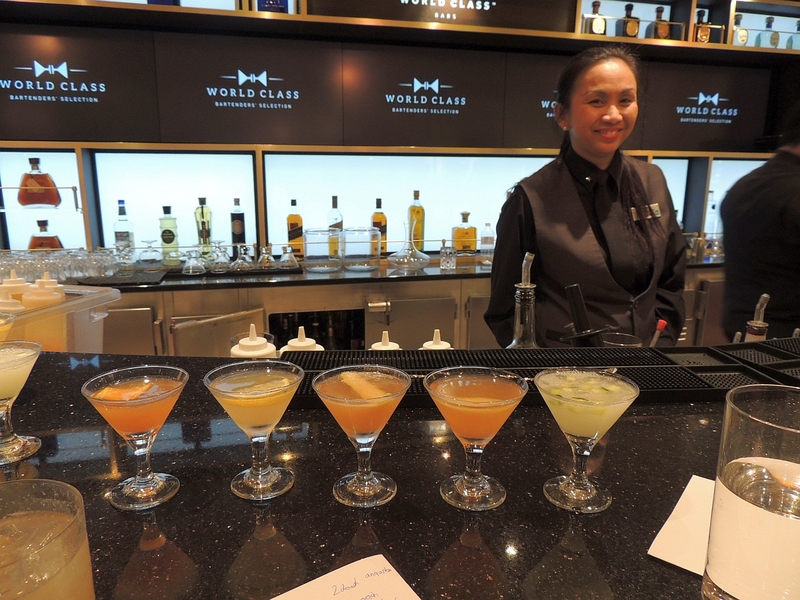 We have signed up for the mixology class at the World Class Bar at 2.00pm, but when we arrive it appears there is a mix up in the start time (how appropriate) as it is now starting at 3.00pm. Thats no problem as it gives us time to see John Mankas last presentation of the cruise in Celebrity Central. Another fascinating 45 minutes as he talks to us about ways to slow down time, basically enjoying life to the full and taking every opportunity to experience new and exciting things. 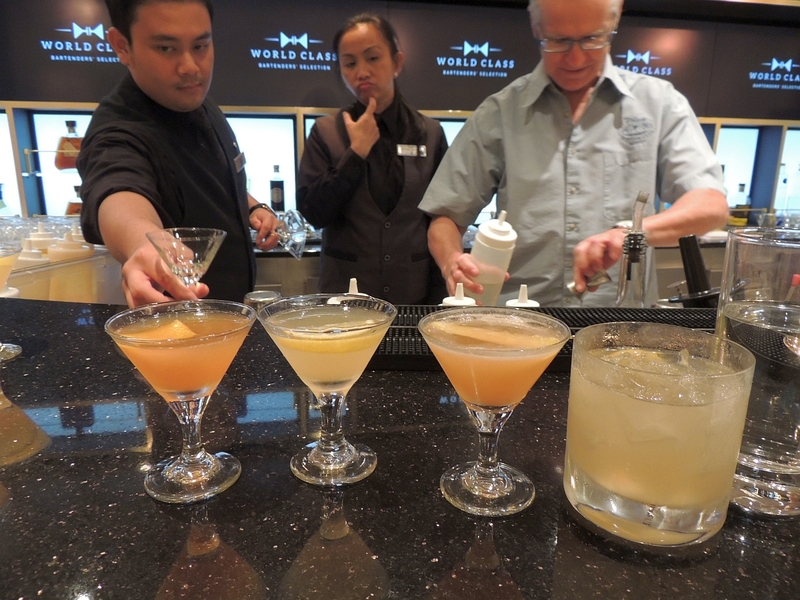 Back to the mixology class and it is only me, Tam and an Australian lady called Sue that attend. Still, its good fun and we all have a go at making at least one of the 4 cocktails, all of which are very nice as they are proper cocktails made with real fruit juices or syrups. It costs $25 per person. Slightly squiffy we head back to the stateroom and start the painful task of packing. At this stage of any holiday I usually start to get a little melancholy and reflect how things have gone, but knackers to that  we still have another night of eating and drinking to enjoy! We shower and leave the room at 6.15pm to go to the World Class Bar where I have a Hawaiian Lava and Tam has a Tan Russian, pretty much our go to drinks on this holiday. Both Loida and Rahadrian thanks us for the additional gratuity we left for them. I get a Negroni and take it with me to the Solstice Theatre where we arrive 15 minutes after the show has started. Its the Australian Beatles tonight and I have to say its a bit strange to see middle-aged men on stage dressed up in 60s suits with mop tops. To give them their due, the music is very good and they sound pretty close to the real thing. I could probably do without the faux Scouse accents though. Half way through their set they change into Sergeant Pepper outfits and play songs from the latter half of The Beatles career. At the end they do an encore and get everyone to stand up and dance to Twist and Shout. All in all its a fun show. Our final dinner is at Murano. Tam starts with the Anjou Pear in Phyllo Pastry with Gorgonzola and I have the Goats Cheese Soufflé. Its not something Id normally choose, but its really nice. We both have the lobster for our main course and its prepared tableside. Again, not something Id normally have, but we both enjoy it very much. Theres a bit of a shock next as Tam decides shes too full for dessert, but I reckon I can handle one and have the Chocolate Lava Cake with caramel sauce and coffee ice cream. Its probably the weakest of the 3 dishes, but overall the meal has been excellent. 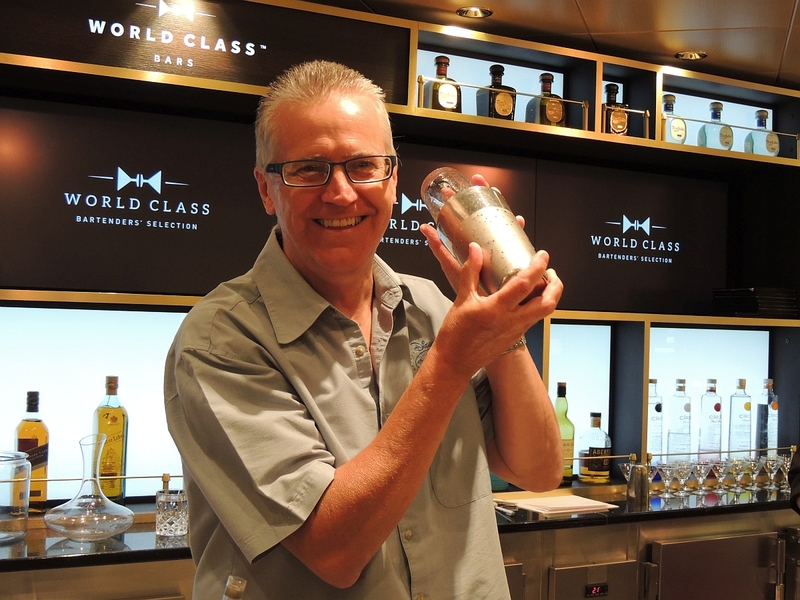 A quick walk around the deck and we finish our holiday in the only place we possibly can  the World Class Bar. Another Hawaiian Lava for me just about depletes the stock of fig infused bourbon and Loida makes all at the bar a free Apple Martini to see us off to bed.